Blog update tonite on Mumbai outlook and NEM...by 10.30 pm IST..
Super Cyclone Phailin was at it. Aiming at the East Coast and hurtling towards it at 210 kmph..enough to cause major destruction and loss of lives. Excellent preparedness by authorities and timely warnings from IMD saved major damage and saved loss of lives...IMD did a very good job in accurate predictions and tracking estimates..Kudos ! Neeraj gives some details from Nepal in "comments"....Raining and overcast. Kathmandu airport received 6 mms rainfall till 8 pm and the day's high was 19.8c. Current temperature at 5 pm 17.0c. Sunday, as the system mived North into Jharkhand and Bihar, Jamshedpur got 99 mms and Ranchi 43 mms till 5.30 pm (9 hrs). As on 8.30 am IST Sunday: Banki ARG 381 mms, Balimundali 305 mms, Ranpur 296 mms, Chaibasa 199 mms. Bhubaneshwar has recieved 169 mms, Keonjhargarh 150 mms, Chandbali 123 mms,Puri 119 mms, Balasore 110 mms, Paradip 76 mms and Sambhalpur 30 mms. Heavy rainfall Warnings for Bihar, Sikkim, North W.Bengal and Central and Eastern Nepal. Very heavy rains in these regions may precipitate around 100-200 mms in 24 hrs, causing local flooding of regional rivers in Jharkhand and Bihar. People were saying this storm is worse then katrina in USA but i would say it was nothing compared to katrina, exagerating weather bureaus. A weak trough expected near North TN coast around 20th which would give the pre-monsoon showers and pull the easterlies..
Rajesh sir..whatz ur view on the NEM onset? As far 2013 monsoon is concerned, it seems nothing could break GUJARAT 24 hrs extreme rains - recent 7 continuous days of torrential downpours at times 400mm- 300mm in 24 hrs, july valsad rains... and of course cyclone Phailian - also could not break GUJ rains... (we are all sad for poor homeless people...). Both cyclone Phailian and Typhoon Nari are in same latitude so as typhoon moves west it may seed something again in Bay?????? NEM seems to be in deep trouble-- bad days for southern India..
continuos rain in kathmandu, nepal since 11 o'clock in the morning. and it shows no sign of stopping any time soon. Would 'Nari', crossing vietnam at the moment spawn another cyclone in the bay ? Two cyclones in a row looks very unlikely. Junaid: shall issue Mumbai details tomorrow.. The much maligned IMD found some redemption, its forecast on the storm fared better than most of other forecasters. Kudos to them and also to the various bloggers across the country who have been tracking the storm and providing valuable inputs to everyone concerned. 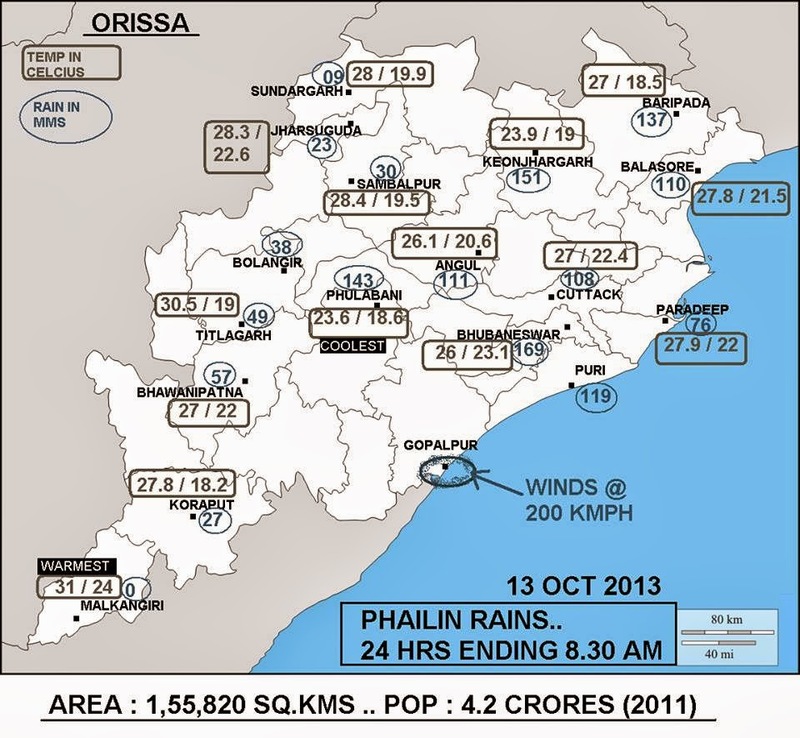 Phailin dance is OVER of the Weather department. -I's been raining heavily again Mira road again now at 09.00 am ..also confirmed that it's raining in Powai as well..
Overnight rain 25 mms; min temp around 15, overcast, now temp at 10 AM is around 17 C; if it rains for the rest of the day, daytime high won't climb above 20 C or so. It is as if the system has crashed into the foothills of Himalayas, and is going to dump a lot of rain here before dissipating. Wow. You all are lucky at coastal belt getting daily early morning rain !! Here in Badlapur typical Oct weather with daily fog & clear sky from midnight onward and fog getting denser in early morning hrs ! I pesonally feel that this localized rain that too limited to coastal belt is drifting of clouds from sea due to weak pull effect of Bay cyclone Phailin effect !! 30 mins extremely heavy rains with thunder and stormy weather. Navi Mumbai too received torrential downpours early morning between 4.30am-6.30am. Monsoon kind of rains.. Mumbai / MAHA is receiving almost receiving everyday rains (month of October)--probably axis is still active in central region refusing to move south. As per vagaries map published by Rajesh Sir - we do not see any high pressure areas in northern, central india - probably axis is taking advantage of this..
here also in malad we received good showers between 10 - 11am. Parts of Mumbai are getting thunder showers since the last 2/3 days. From South Mumbai on Sunday to Northern parts on Monday. The reason is an upper air trough running east west from coast to 60E in the Arabian Sea off maharashtra coast. Its seasonal for the withdrawal time.such a trough initiates inland and coastal thunder showers, as the axis starts shifting towards the South and enriches the sea trough. What is wrong with the Mumbai Doppler Radar? Amazing to see that the Radar is down for more than a week now. Wonder what are they testing? Is there a way to ping the local IMD? I prefer to answer queries to those who diretly give their names, as it becomes easy to converse with you on personal levels..those who have not yet revealed their names please be free and open to discussions on one to one basis...otherwise replying to those with "concealed names" will not be convenient. Rajesh Sir...i think i have already shared my name..i believe you have also joined the bandwagon (along with ppl from some other blog) in giving importance to screen names and especially against me..ppl posting with some "human" names doesn't mean they are revelaing their original names and u too do not care about investigating them..it doesn't matter much..anyway, i would continue to post with this name everywhere..and thanks for your replies till now.